News call them protesters, but I call them patriotic and peaceful celebrant. It is a huge showcase of Polish nationalism revival and anti-EU protest. The EU is seen as being the biggest threat to the country’s sovereignty, which is true. nation, after 123 years of division among Russia, Prussia and Austria! National Independence Day is a public holiday in Poland. The 1000 years old Sovereign Poland ceased to exist after the Third Partition of Poland (1795), when the territory of the Polish-Lithuanian Commonwealth was divided between the Russian Empire, the Austrian Empire, and Prussia. Poland became able to regain its independence, when the empires collapsed as a result of WWI. On November 11, 1918, Józef Piłsudski arrived in Warsaw and assumed control of Poland. National Independence Day was instituted as a public holiday in 1937. It was celebrated twice before WWII broke out. It was not celebrated officially under the Communist regime, although some people observed it informally. Independence Day of Poland was restored in 1989 and has been celebrated each year ever since. It is widely celebrated throughout the country with parades, marches, concerts, firework displays, official speeches and church ceremonies. The main military parade is held at the Piłsudski Square in the capital city of Warsaw. 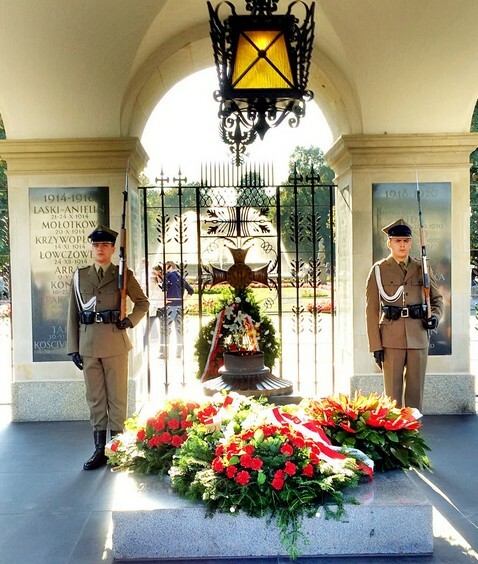 It includes a wreath laying ceremony at the Tomb of the Unknown Soldier. This entry was posted on November 11, 2015 by HKW in Polish Independence Day and tagged Freedom, Nationalism, Poland.